Artist K. Sean Sullivan has been interested in WWII as long as he can remember. His father, father-in-law, and five uncles served in the war and Sean began collecting WWII memorabilia as a youth. Appropriately, one of his first artistic idols was Bill Mauldin. His talent in art was noticed early on. Sean’’s first professional employment was as a scenic artist for a theater where he painted backdrops for “The Sound of Music.” Soon after, in 1980, he joined the Utah Army National Guard and served as an Illustrator-Draftsman in the HHC of the 19th Special Forces Group. 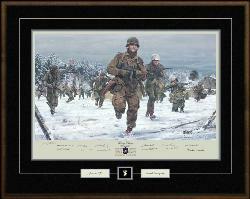 His work has earned regional and international acclaim and can be found in the National Infantry Museum at Fort Benning.